earlier this summer i was asked if i would like to lead one of the block of the month programs when they started back up in the fall. of course i said that i would love too! so i started looking right away at what pattern would be a good BOM. 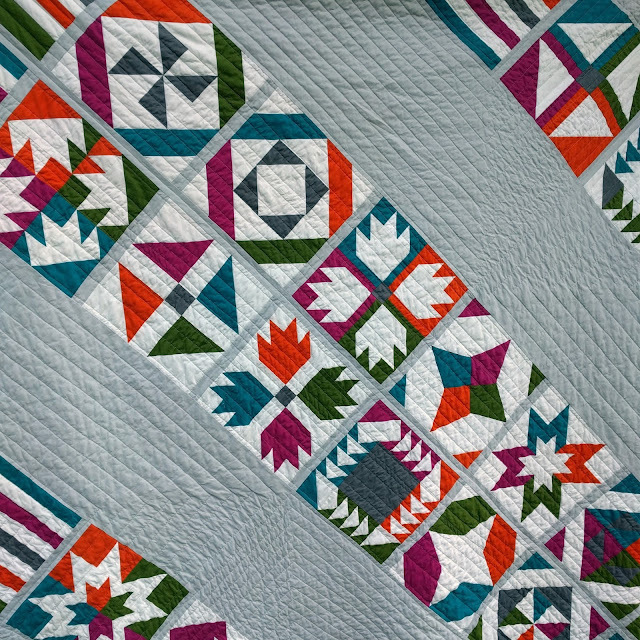 well needless to say I kept coming back to AnneMarie Chany's book Sister Sampler Quilts. i particularly loved the Vice Versa quilt. i love taking traditional blocks and setting them in a modern way. 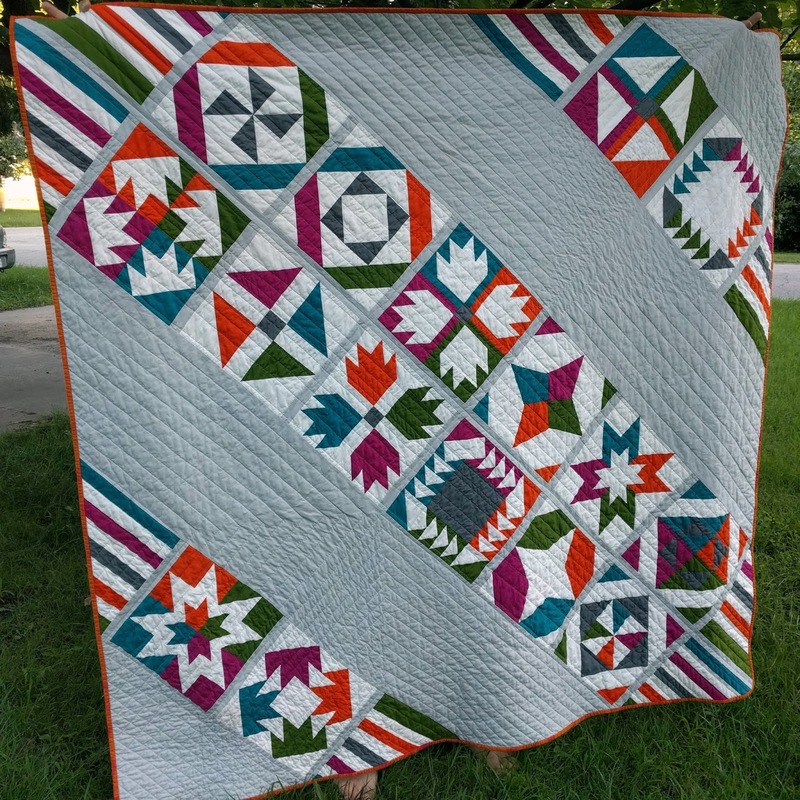 plus i have really enjoyed half-square triangles from the modern half-square sampler from Alyce of Blossom Heart Quilts. i chose to follow AnneMarie and make my sample quilt up in solids. i have only recently started to enjoy working with solids and well this quilt really raised my love of solids. i used all Moda Bella solids and chose bright saturated colors with the addition of the dark gray. the lighter gray for the background and sashing allow the blocks to really shine. for the quilting, i decided on straight (straight-ish) lines. in the center my quilting lines are unevenly spaced, then in the sections I broke up with the quadrants I evenly spaced my quilting lines either by an inch or inch and a half. plus with the straight line quilting, the blocks really become the stars as then should be in a sampler quilt. i loved working on this project. it was nice to have a deadline to get a sample made up. i really had to push myself a bit to keep on schedule. thank goodness for an understanding hubby who kept the girls occupied if i need to work on this quilt. honestly i couldn't do most of my quilting without him helping out in the evenings. he really is the best hubby and father! 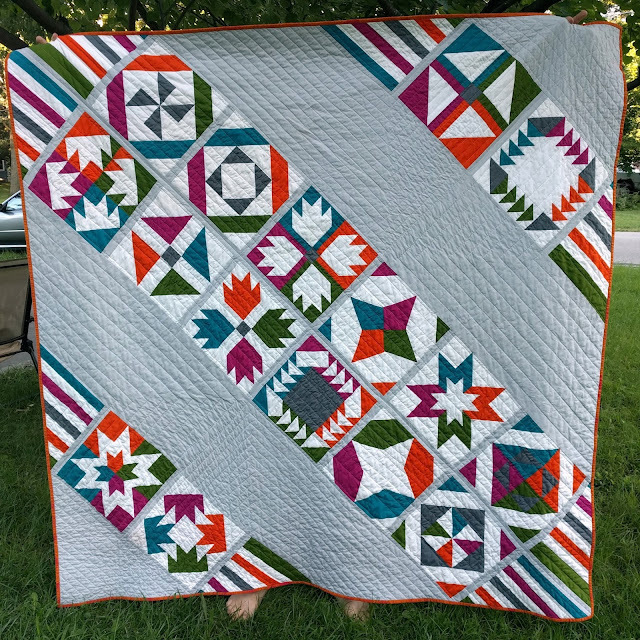 now i can drop my quilt off at my LQS and i can't wait to see it hanging in the shop! What a great finish! Love your colors.